Rapoo specializes in wireless peripherals for Apple, Android, and personal computers. These include a wide range of products from mice, headphones, and keyboards, with a unique and elegant design form-factor. Today we are looking at the Rapoo E6300 BT keyboard for iPad, which retails at approximately $50, available now at retail stores and online. Designed for iPad featuring specific hot keys including: home button, photo slideshow, music playback, and screen-lock functions. Built-in high performance rechargeable lithium battery charges easily within 2 hours and lasts up to 1 month of use. USB charging cable is included. Bluetooth 3.0 technology means no wires and you can get up to 10 meters transmission distance. Here’s the Rapoo laying on the back side of an iPad 3 for physical comparison. It is very slender by nature and designed that way for ultra-portability purposes. Compared to typing on the glass screen of the iPad, the Rapoo keyboard not only provides a lot more real-estate (in the fact that all keys are immediately available rather then using function keys to pull up the alternate menus on the virtual keyboard), but implements actual tactile feedback. The packaging had an incredibly small footprint with no-frills or extra waste. The back of the box presented a few of the specs listed above as well as basic charging procedures (in a variety of languages). Inside the box was a usb charging cable and a small fold-out quick-start guide. The main base of the unit consists of rigid brushed aluminum, thick enough to prevent any easy flexing. The main alpha-numeric keys are all full size, which is one of the main attractive features of this product; however, the hot keys, function keys, and arrow keys are all of a much skinnier nature. All keys are laser-etched for durability and longevity. Tactile feedback is linear with a rather shallow depression-action (as would be expected considering how thin the keyboard is) with each key possessing it’s own spring mechanism. On the back of the keyboard is the lithium battery, power switch, syncing button, and the micro-USB charging port (located right above the power indicator light). Two small rubber feet on the bottom base of the keyboard provide non-slippage and a secure grip on almost any surface. An iPad 3 (16 gig model) with the most current iOS version was used for testing the Rapoo E6300. To check for any wireless latency issues with the keyboard a continuous load of streaming music was sent to a Yamaha receiver during testing. Interestingly enough to note, there are many discrepancies concerning how many devices may be enabled simultaneously on the iPad’s bluetooth network. Officially with the iPad it is 2 connections; however, some 3rd party peripherals will not connect to an iPad if a bluetooth signal is already present and active. The Rapoo E6300 had no issues connecting with these concerns in mind. The pairing procedure was straightforward: turn on the Bluetooth on the iPad, power up the Rapoo, press the sync button on the back of the keyboard, and enter the 4 digit number presented on the iPad into the keyboard. This only needs to be done once, for the iPad will remember the device pairing for future use. The transmitter in this keyboard appears solid, exceeding the stated 10 meters distance on a full charge easily, and didn’t miss a keystroke. Concerning latency, it was such a non-issue that the Rapoo may as well been wired into the iPad directly – it’s that reliable and instantaneous. The charging characteristics stated in the specifications indicate that the keyboard charges in approximately 2 hours via standard USB port. Using a USB to A/C adaptor the keyboard charged fully in approximately 35 minutes (the power indicator light will turn off when fully charged). Impressively enough, a single charge is good for 1 months worth of use. 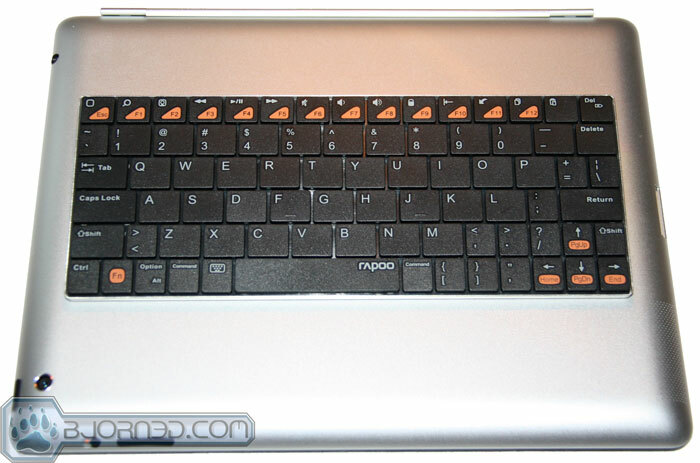 Concerning the form-factor of the Rapoo E6300, even though the main keys are full sized, they are placed together as tight as possible, favoring those with medium to small hands. This makes it difficult if you are one that prefers to look at the keyboard while typing since your hands are mostly blocking the view; furthermore, the black keyboard model needs a moderately lit area to read the smaller function and hot keys — this may not be the case with the white model with the blue lettering. Be aware that applications may not have some of the native keyboard features supported; for example, in Safari there is no obvious way to scroll pages up or down (with arrows or page up/down keys) or to toggle the cursor between input fields (like the address and search bar). It is of interest to note that the Rapoo E6300 has been previously awarded the iF Product Design Award, distinguished by three disciplines encompassing a product: innovation, communication, and packaging design. This review also reflects those qualities. At a rather modest price point of $50, the build quality of the tactile keys and the actual casing is solid. The performance concerning connectivity was error-free (with not a keystroke ever missed) and initial setup was as simple and straight-forward as it gets. The main issue some may have is that the physical size my impede those with larger hands, but overall a solid recommendation for those looking for a portable keyboard for taking notes or writing short letters. Tactile feedback in a portable form-factor. Very quick charge time for 2 months of use. Larger hands may find typing difficult. Hot key icon labels are difficult to read due to size. Not all applications are designed to take advantage of the keyboard. Summary: The Rapoo E6300 keyboard is recognized as one of the first small form-factor bluetooth keyboards that ranks top in performance and quality build and is rewarded with the Bjorn3D Silver Bear Award. Previous Bjorn3D / Diamond Multimedia – Holiday Giveaway! los click funccionan pero el cursor no se mueve , algun truco ? io intente varios. Is it possible that I can pair it to both iPad and iPhone and I can choose wich one it connect to? I, to my misfortune, am in posession of Rapoo keyboard. I have to say that everything what You said about its latency must b unchecked. It is Very Annoing to use that turtle speed piece of crap. I’m a programmer and I know what I say. One has to constantly press same key all over again, after switch from one window to another. Its just Eating Letters Allive! Email me if You wanna buy it. Cheap.